Dr. Pauline Mosley was honored Tuesday May 10th with a STEM Award for her significant contribution to children in the STEM field. Dr. Mosley was selected for this award because of the three years she has spent working with GIRLS Academy. Over the past few years, Dr. Mosley has helped develop and design STEM Curricular for the White Plains Afterschool Programs. These programs offered awesome opportunities for girls aged 13-17 to learn about LEGO Mindstorms, SeaPerch robots, Alice, and HTML coding. The programs took place over 9 week periods, with Dr. Mosley working closely with the instructors of the sessions (instructors whom she happened to mentor and teach previously!). 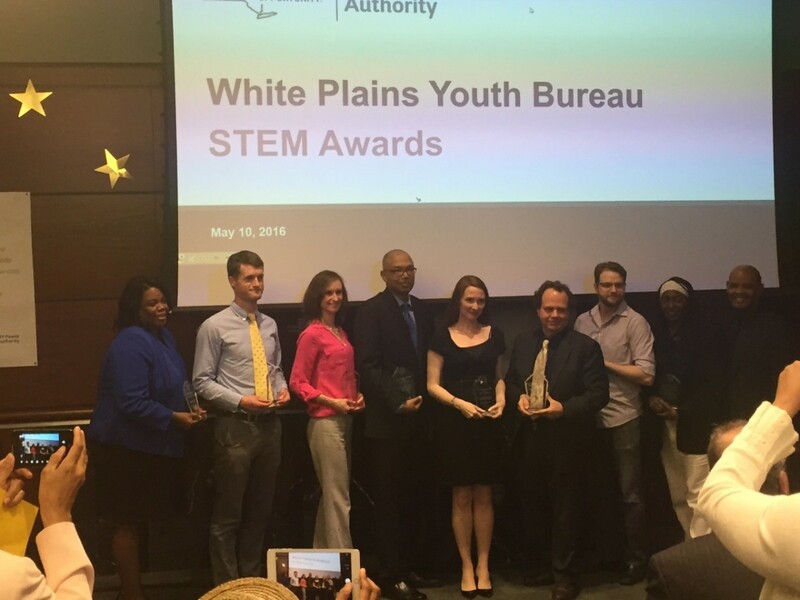 The event was attended by the Mayor of White Plains and thanked the award recipients for improving the White Plains School District. Pictured above is Dr. Mosley alongside White Plains Middle and High School Teachers, as well as fellow Pace professor Dr. Gerald Ardito. Congratulations to Dr. Mosley! Hopefully we will see some of these amazing workshop participants at Pace in the near future!